Common names: garden sorrel, herb patience or spinach dock, French sorrel, spinach rhubarb. Botanical name: Rumex acetosa, Rumex patientia, Rumex scutatus, Rumex abyssinicus. Few varieties are available commercially; grow the variety available in your area. Garden sorrel, French sorrel, and herb patience or spinach dock are all good for eating. Several varieties of sorrel will do well in your garden. Garden sorrel (R. acetosa) grows about three feet tall and produces leaves that are good used fresh in salads; herb patience or spinach dock (R. patientia) is a much taller plant, with leaves that can be used either fresh or cooked. French sorrel (R. scutatus) grows only six to 12 inches tall; its fiddle-shaped leaves make good salad greens. Spinach rhubarb (R. abyssinicus) is a lofty plant— it grows up to eight feet tall. As the name suggests, you can cook the leaves like spinach and the stalks like rhubarb. Avoid other varieties — they're weeds and not good for eating. All the sorrels are very hardy and can be grown in almost every area of the United States. Start them from seed in the early spring before your average date of last frost. All the sorrels require a sunny location with well-drained, fertile soil. When you're preparing the soil, dig in a complete, well-balanced fertilizer at the rate of one pound per 100 square feet or 10 pounds per 1,000 feet. Plant sorrels from seed two to three weeks before the average date of last frost. Plant the seeds a half inch deep in rows 18 to 24 inches apart, and when the plants are six to eight weeks old, thin them to 12 to 18 inches apart. Fertilize before planting and again at midseason, at the same rate as the rest of the garden. Detailed information on fertilizing is given in "Spadework: The Essential Soil" in Part 1. Aphids will probably show interest in your sorrel. Control them by pinching out infested areas or hosing the aphids off the plants; or spray with Malathion or Diazinon. 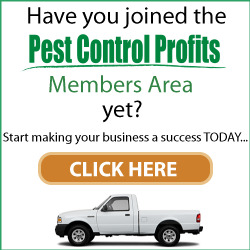 Detailed information on pest control is given in "Keeping Your Garden Healthy" in Part 1. Sorrel has no serious disease problems. Pick the fresh leaves of the sorrel throughout the growing season. Pick off the flowers before they mature to keep the plants producing new leaves long into the fall. Use sorrel fresh, or store sorrel leaves in the refrigerator for one to two weeks. You can also freeze or dry the leaves as herbs, but you'll lose some flavor. Detailed information on storing and preserving is given in Part 3. You can use sorrel leaves raw, as salad greens or very lightly steamed or boiled and tossed in butter. Sorrel soup is a classic French favorite, and the Russians use sorrel in a green borscht soup. In the time of Henry VIII, sorrel was used as a spice and to tenderize meat. The English also mashed the leaves with vinegar and sugar as a dressing for meat and fish — hence the name green sauce. A number of varieties have been bred to adapt to certain types of climate. Ask your Cooperative Extension Service for specific recommendations for your area. The soybean is a tender, free-branching annual legume. Though it can grow five feet tall, it's usually only two to 3y2 feet tall. The stems and leaves are hairy; the flowers are white with lavender shading, and the pods are one to four inches long and grow in clusters. The soybean is extremely high in protein and calcium and is a staple of a vegetarian diet. It's also very versatile and can be used to make milk, oil, tofu, or a meat substitute. The ancient Chinese considered the soybean their most important crop. The United States now produces about 75 percent of the world's soybeans. Soybeans are sensitive to cold and most varieties have a narrow latitude range in which they will mature properly and produce a good crop. Plant a variety suited to your area about two to three weeks after the average date of last frost. Don't plant before the soil has warmed up. After the last frost is over, choose a bed in full sunlight; soybeans tolerate partial shade, but partial shade tends to mean a partial yield. Prepare the soil by mixing in a pound of 5-10-10 fertilizer — don't use a high-nitrogen fertilizer, because too much nitrogen will promote growth of foliage but not of the beans. Work the fertilizer into the soil at the rate of one pound per 100 square feet or 10 pounds per 1,000 square feet. The seeds may crack and germinate poorly when the moisture content of the soil is too high. Don't soak the seeds before planting, and don't overwater immediately afterwards. Plant seeds an inch deep, one to two inches apart in rows 24 to 30 inches apart. When the seedlings are growing well, thin the plants to two inches apart. Cut the seedlings with scissors at ground level; be careful not to disturb the others. Soybeans don't mind being a little crowded; in fact, they'll use each other for support. Soybeans set up a mutual exchange with soil microorganisms called nitrogen-fixing bacteria, which help them produce their own fertilizer. Some gardeners recommend that if you haven't grown soybeans or beans in the plot the previous season, you should treat the seeds before planting with a nitrogen-fixing bacteria inoculant to help them convert organic nitrogen compounds into usable organic compounds. This is a perfectly acceptable practice, but it isn't really necessary; the bacteria in the soil will multiply quickly enough once they've got a growing plant to work with. Keep the soil moist until the soybeans have pushed through the ground. Water regularly if there's no rain, but remember that water on the flowers can cause the flowers and small pods to fall off. When the soil temperature reaches 60°F you can mulch to conserve moisture. Don't handle soybean plants when they're wet or covered with heavy dew; handling or brushing against them when they're wet spreads fungus spores. Cultivate thoroughly but with care, so that you don't disturb the plants' shallow root systems. Soybeans do not have many pest problems, unless you're growing them in an area where soybeans are produced commercially. Flea beetles may appear; hand-pick or hose them off the vines, or spray with carbaryl. Rabbits, raccoons, and woodchucks love soybeans and can be strong competitors for your crop. Discourage them by removing places where they can nest or hide or by fencing them out of your garden. Detailed information on pest control is given in "Keeping Your Garden Healthy" in Parti. Soybeans have no serious disease problems. Time from planting to harvest is 45 to 65 days, and a 10-foot row will supply one to two pounds of beans. The yield is not generous, so except for novelty value, soybeans are not the ideal crop for a small home garden. Harvest when the pods are about four inches long or when they look plump and full. Store fresh unshelled soybeans in the refrigerator up to one week. Shelled soybeans can be frozen, canned, or dried. They can also be sprouted. Dropping the pods into boiling water for a minute or two makes shelling easier. Dried, shelled soybeans can be stored in a cool, dry place for 10 to 12 months. Detailed information on storing and preserving is given in Part 3. The Japanese cook soybeans in salted water, serve them in the shell, and then squeeze out the seeds and eat them. Soybeans are extremely versatile; they can be made into oil, milk, or tofu — a major foodstuff among vegetarians. 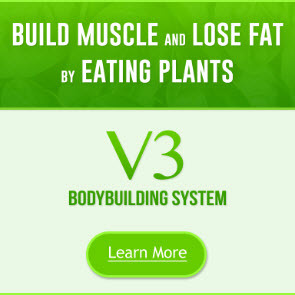 Soybeans are also used as a high-protein meat substitute or ground into flour. Soybeans supply about half the vegetable fats and oils used in this country. Only a few varieties of New Zealand spinach are available; use the variety available in your area. There are two kinds of spinach — the regular kind which is a hardy annual, and the less well-known New Zealand spinach, which is a tender annual and is not really spinach at all. Spinach, the regular kind, is a hardy annual with a rosette of dark green leaves. The leaves may be crinkled (savoy leaf) or flat. Spinach is related to beets and chard. The cartoon character Popeye made spinach famous with young children because he attributed his great strength to eating spinach — probably with some justification, because spinach has a very high iron content. Spinach was brought to America by the early colonists; the Chinese were using it in the sixth century, and the Spanish used it by the 11th century. 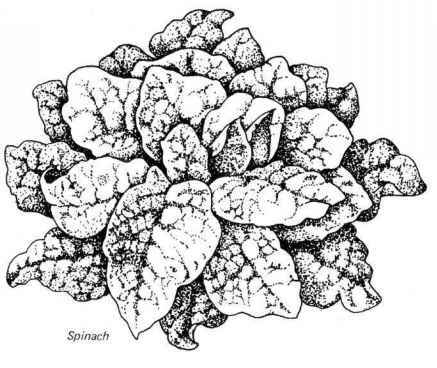 New Zealand spinach (Tetragonia expansa) comes — as the name indicates — from New Zealand. It's a tender annual with weak, spreading stems two to four feet long, sometimes longer, and it's covered with dark green leaves that are two to four inches long. New Zealand spinach is not really spinach at all, but when it's cooked the two are virtually indistinguishable. The leaves of New Zealand spinach are smaller and fuzzier than those of regular spinach, and it has the advantage of being heat-tolerant and able to produce all summer. Heat makes regular spinach bolt, or go to seed, very quickly. Spinach is very hardy and can tolerate cold — in fact, it thrives in cold weather. Warm weather and long days, however, will make it bolt, or go to seed. Ideal spinach weather is 50° to 60°F. Spinach grows well in the winter in the South, and in early spring and late summer in the North. Plant it about four weeks before your area's average date of last frost. New Zealand spinach likes long warm days. It grows best at 60° to 75°F and won't start growing until the soil warms up. It has a short season, however (55 to 65 days), so it can be grown successfully in most areas of the United States. Plant it on the average date of last frost for your area. Plant New Zealand spinach to supply you with a summer harvest long after it's too hot for regular spinach. Both spinach and New Zealand spinach are grown — like beets and chard — from seed clusters that each produce several seedlings. This means they must be thinned when the seedlings appear. 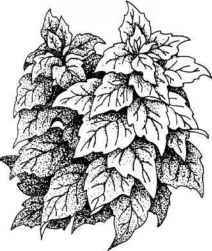 Both types tolerate partial shade and require well-drained soil that's rich in organic matter. Spinach does not like acid soil. When you're preparing the soil for planting, work in a complete, well-balanced fertilizer at the rate of one pound per 100 square feet or 10 pounds per 1,000 square feet. Plant spinach seed clusters half an inch deep, two to four inches apart, in rows 12 to 14 inches apart, and when the seedlings are large enough to handle, thin them to leave the strongest seedling from each cluster. For New Zealand spinach, plant the seed clusters half an inch deep, 12 inches apart, in rows 24 to 36 inches apart. Thin when the seedlings are large enough to handle, leaving the strongest seedling from each cluster to grow. Cut off the others with scissors at soil level. Fertilize both types before planting and again at midseason, at the same rate as the rest of the garden. Detailed information on fertilizing is given in "Spadework: The Essential Soil" in Parti. leaves — it will make the spinach difficult to clean after harvesting. Mulch to avoid getting soil on the leaves. New Zealand spinach especially needs a regular supply of water to keep it producing lots of leaves. Spinach does not like competition from weeds. Cut weeds at ground level to avoid damaging the shallow roots of the spinach plants. Aphids and, occasionally, leafminers may attack spinach. 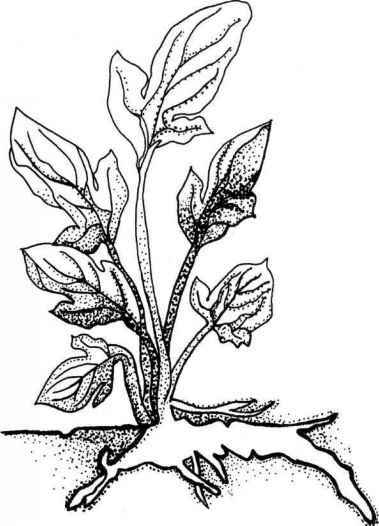 Pinch out aphid-infested foliage, and remove leaves on which leafminers have laid their eggs — look for the eggs on the undersides of the leaves. Control aphids chemically with Malathion or Diazinon; chemical controls are ineffective on leafminers once they're inside the leaf. New Zealand spinach has no serious pest problems and is a good crop for the organic gardener. Detailed information on pest control is given in "Keeping Your Garden Healthy" in Parti. Spinach New Zealand seedling spinach seedling resistant. Planting disease-resistant varieties and maintaining the general cleanliness and health of your garden will help cut down the incidence of disease. If a plant does become infected, remove it before it can spread disease to healthy plants. New Zealand spinach has no serious disease problems. Detailed information on disease prevention is given in "Keeping Your Garden Healthy" in Part 1. For spinach, time from planting to harvest is 40 to 52 days, and a 10-foot row should yield about five pounds of spinach leaves. To harvest, either pick the outside leaves periodically, or pull up the whole plant at one time. Be sure to wash spinach thoroughly to eliminate the grit that sometimes sticks to the crinkled leaves. For New Zealand spinach, time from planting to harvest is 55 to 65 days, and a 10-foot row will produce about five to 10 pounds of leaves. To harvest keep cutting the tender tips off the ends of the stems; this will encourage new growth, and you can harvest until the first frost. Both types of spinach can be refrigerated for up to one week. They can also be frozen, canned, or dried. Spinach seeds can also be sprouted. Detailed information on storing and preserving is given in Part 3.
spinach is wonderful in salads, and its dark green leaves add color and variety to lettuce. Add orange segments and almonds to a salad of fresh spinach, and toss in a sweet-sour dressing. Or add crumbled bacon, hard-cooked egg, and croutons. Add cubes of cheese to spinach, peppers, and sliced fresh mushrooms for an appealing lunch-time salad. Children who hate cooked spinach on principle often enjoy it raw. Cooked spinach is delicious creamed or in a souffle, in crepes or topped with poached eggs. Try it with a horseradish sauce, or with melted butter and a little garlic. Spinach is an attractive ingredient for a quiche; add flaked salmon for a more . substantial meal. Crookneck: Golden Summer Crookneck (53 days). Scallop or pattypan: Peter Pan (60 days); Scallopini hybrids (60 days); St. Patrick Green Tint (60 days). Straightneck: Early Prolific Straightneck (50 days). Zucchini: Gold Rush (60 days); Zucchini hybrids (60 days). These are only a few of the varieties available. Ask your Cooperative Extension Service for other specific recommendations for your area. The cucumber family, to which squashes belong, probably has the greatest diversity of shapes and sizes of any vegetable family except the cabbages. It's the genus Cucurbita and includes certain gourds and pumpkins, as well as squashes. Most are trailing or climbing plants with large yellow flowers (both male and female); the mature fruits have a thick skin and a definite seed cavity. "Summer squash," "winter squash," and "pumpkin" are not definite botanical names. "Pumpkin," which any child can tell you is a large vegetable used for jack-o'-lanterns and pies, is applied to long-keeping varieties of C. moschata, C. pepo, and a few varieties of C. maxima. 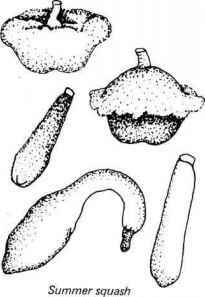 Summer squashes are eaten when they are immature; winter squashes are eaten when mature. Squashes are hard to confine. 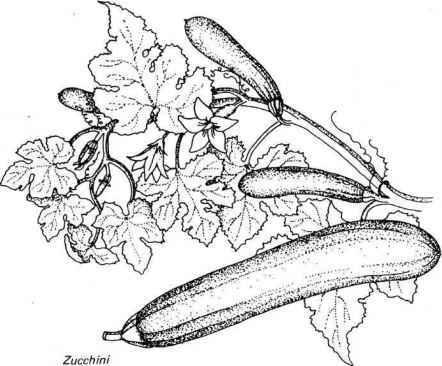 A bush-type zucchini will grow well in a tire planter if kept well-watered and fertilized; a vining squash can be trained up a fence. Summer squashes are weak-stemmed, tender annuals, with large, cucumberlike leaves and separate male and female flowers that appear on the same plant. Summer squash usually grows as a bush, rather than as a vine; the fruits have thin, tender skin and are generally eaten in the immature stage before the skin hardens. The most popular of the many kinds of summer squashes are crookneck, straightneck, scallop, and zucchini. Squashes are warm-season crops and very sensitive to cold and frost. They like night temperatures of at least 60°F. Don't plant the seeds until the soil has warmed up in spring, about two to three weeks after the average date of last frost for your area. Direct-seeding is best for squashes, but if you're planting a variety that requires a longer growing season than your area can provide, use transplants from a reputable nursery or garden center, or grow your own. To grow your own transplants, start four to five weeks before your outdoor planting date, and use individual plantable containers to lessen the risk of shock when the seedlings are transplanted. Make sure that the plantable containers are large enough for the variety of squash you're planting. you'll disturb the roots of the remaining seedlings. Keep the soil evenly moist; squashes need a lot of water in hot weather. The vines may wilt on hot days because the plant is using water faster than the roots can supply; if the vines are getting a regular supply of water, don't worry about the wilting — the plants will liven up as the day gets cooler. If squash vines are wilting first thing in the morning, water them immediately. If you grow squashes indoors, or in an area where there are no insects to pollinate the female flowers — your 51 st-floor balcony, for instance — you may need to pollinate the flowers yourself. Take a soft-bristled brush and dust the inside of a male flower (the one without an immature fruit on the stem), then carefully dust the inside of the female flowers. Squash bugs, squash borers, and cucumber beetles are the major pests that squash plants attract. They don't usually show up until you have a good harvest, so squash is still a good choice for the organic gardener. Squashes are prolific, so you can afford to lose a few of your crop to the bugs. Beetles can often be controlled by hand-picking or hosing them off the plants. Control them chemically with carbaryl. To control borers, apply carbaryl to the crowns of the plants at weekly intervals. Do this as soon as there's any suspicion of damage — once the borers get inside the plants, chemical controls are ineffective. If a small hole in the stem tells you borers are already inside, you may still be able to save the plant. Slit the stem, remove the borers, and dispose of them. Then cover the area with soil to encourage root development at that point. Detailed information on pest control is given in "Keeping Your Garden Healthy" in Part 1. Squashes are susceptible to bacterial wilt, mosaic virus, and mildew. Planting disease-resistant varieties when they're available and maintaining the general cleanliness and health of your garden will help lessen the incidence of disease. When watering, try to keep water off the foliage, and don't handle the plants when they're wet — this can cause powdery mildew and spread disease. If a plant does become infected, remove and destroy it before it can spread disease to healthy plants. Detailed information on disease prevention is given in "Keeping Your Garden Healthy" in Part 1. Time from planting to harvest depends on the variety, as does the yield you can expect. Harvest summer squashes when they're young — they taste delicious when they're small, and if you leave them on the plant too long they will suppress flowering and reduce your crop. Harvest summer squashes like the zucchini and crookneck varieties when they're six to eight inches long; harvest the round types when they're four to eight inches in diameter. Break the squashes from the plant, or use a knife that you clean after cutting each one; if the knife is not perfectly clean, it can spread disease to other plants. Summer squashes can be stored in the refrigerator for up to one week; don't wash them until you're ready to use them. They can also be frozen, canned, pickled, or dried. Detailed information on storing and preserving is given in Parts. Summer squashes lend themselves to a good variety of culinary treatments. Saute slices of summer squash with onions and tomatoes for a robust but delicately flavored side dish. Add sliced zucchini and mushrooms to a thick tomato sauce for spaghetti. Halve summer squashes and stuff with a meat or rice mixture, or bake them with butter and Parmesan cheese. Pan-fry slices of summer squash, or simmer them with fruit juice for a new flavor. Use the popular zucchini raw on a relish tray and among vegetables for a tempura or slice it thinly in salads. Use the larger fruits for making zucchini bread. Ace (85 days); Table King (bushtype, 85 days). Butternut: Waltham (95 days); Butterbush (small-fruited bush, 90days); Hercules (95 days). Delicious: Golden Delicious (100 days). Hubbard: Kinred (100 days); Blue Hubbard (100 days). winter squashes are eaten when mature. Squashes are hard to confine. A bush-type squash will grow well in a tire planter if kept well-watered and fertilized; a vining squash can be trained up a fence. Gourds are a close relation of squash. They're warm-season vining crops that are grown primarily for decorative uses; you can also make cooking utensils out of them, and some of them can be eaten when immature. They have the same growing requirements as winter squash, and they're harvested in fall when the shells are hard and glossy. The importance of the gourd was recognized by Henri Christophe, who fought in the American Revolution under Lafayette and was a leader of the slave revolt in Haiti in the early 19th century. As Henry I, he used gourds as a medium of exchange, and Haitian currency is still called gourde, which is also Louisiana slang for a dollar. need support, set the support in place at the time of planting. If you do It later, you risk damaging the plants' roots. Squash varieties like well-worked soil with good drainage. They're heAavy feeders, so the soil must be well-fertilized. When you're preparing the soil for planting, work in a complete, well-balanced fertilizer at the rate of one pound per 100 square feet or 10 pounds per 1,000 square feet. Two to three weeks after your area's average date of last frost, when the soil is warm, plant squash in inverted hills. Make inverted hills by removing an inch of soil from an area about 12 inches across and using this soil to form a ring around the circle. Make the inverted hills three to four feet apart, and plant four or five seeds in each one. When the seedlings are large enough to handle, thin them to leave the two or three strongest young plants standing. Cut the thinned seedlings off at soil level with scissors; if you pull them out you'll disturb the roots of the remaining seedlings. Keep the soil evenly moist; squashes need a lot of water in hot weather. The vines may wilt on hot days because the plant is using water faster than the roots can supply; if the vines are getting a regular supply of water, don't worry about the wilting — the plants will liven up as the day gets cooler, if squash vines are wilting first thing in the morning, water them immediately. 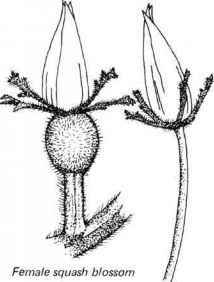 (the one without an immature fruit on the stem), then carefully dust the inside of the female flowers. Squash bugs, squash borers, and cucumber beetles are the major pests that squash plants attract. They don't usually show up until you have a good harvest, so squash is still a good choice for the organic gardener. Squashes are prolific, so you can afford to lose a few of your crop to the bugs. Beetles can often be controlled by hand-picking or hosing them off the plants. Control them chemically with carbaryl. To control borers, apply carbaryl to the crowns of the plants at weekly intervals. Do this as soon as there's any suspicion of damage — once the borers get inside the plants, chemical controls are ineffective. If a small hole in the stem tells you borers are already inside, you may still be able to save the plant. Slit the stem, remove the borers, and dispose of them. Then cover the area with soil to encourage root development at that point. Detailed information on pest control is given in "Keeping Your Garden Healthy" in Part 1. Squashes are susceptible to bacterial wilt, mosaic virus, and mildew. Planting disease-resistant varieties when they're available and maintaining the general cleanliness and health of your garden will help lessen the incidence of disease. When watering, try to keep water off foliage, and don't handle the plants when they're wet — this can cause powdery mildew and spread disease. If a plant does become infected, remove and destroy it before it can spread disease to healthy plants. Detailed information on disease prevention is given in "Keeping Your Garden Healthy" in Part 1. Leave winter squashes on the vine until the skin is so hard that it cannot be dented with your thumbnail, but harvest before the first frost. Break it off the vine, or cut it off with a knife that you clean after cutting each one; if the knife is not perfectly clean, it can spread disease to other plants. Cure squashes in a dark, humid place for 10 days at 80° to 85°F; then store them at 50° to 60°F in a moderately dry, dark place for five to six months. 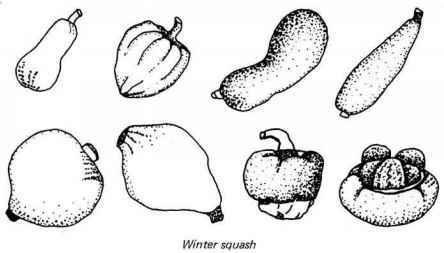 Winter squashes can also be frozen or dried, and the seeds can be sprouted. Detailed information on storing and preserving is given in Part 3. Winter squashes lend themselves to a good variety of culinary treatments and have the flexibility of adapting to both sweet and savory uses. Cut winter squashes into halves and bake them; serve them with honey or brown sugar and butter. Fill the halves with browned sausages, or mash the pulp and season well with salt and pepper. As a treat for the children, top mashed squash with marshmallow and brown it under the grill. Use the pulp of winter squash as a pie filling — it makes a pleasant change from pumpkin. Centennial (150 days); Goldrush (140 days); Jasper (150 days). The sweet potato is a tender vining or semi-erect perennial plant related to the morning glory. It has small white, pink, or red-purple flowers and swollen, fleshy tubers that range in color from creamy-yellow to deep red-orange. There are "dry" and "moist" kinds of sweet potatoes, which describes the texture when they're eaten; some dry varieties have a higher moisture content than some moist ones. The moist varieties are often called yams, but the yam is actually a different species that is found in tropical countries. 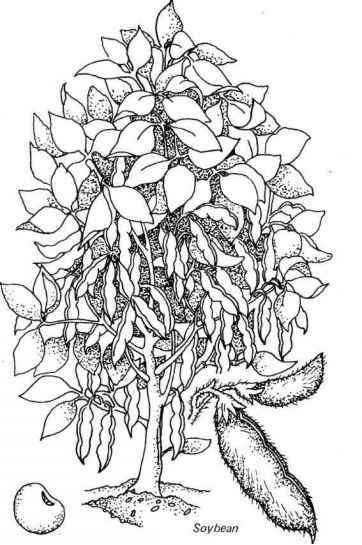 Sweet potato vines are ornamental, so this vegetable is often grown as ground cover or in planters or hanging baskets. You can even grow a plant in water in your kitchen — suspend the sweet potato on toothpicks in a jar of water, and watch it grow. Sweet potatoes are extremely sensitive to frost and need warm, moist growing weather. They have a long growing season — about 150 days — and in areas with a shorter growing season, tend to produce small potatoes. Don't try to hurry sweet potatoes; plant them four weeks after the average date of last frost for your area, or when the soil is thoroughly warm. about six weeks you will have rooted slips that can be planted in the garden. 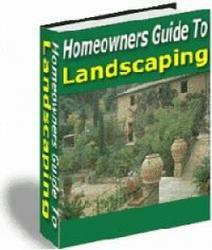 Refer to "Planning Your Garden" for information on making and using a hotbed. If you don't want to go to the trouble of growing your own, buy slips from a reputable garden center or supplier. A good, sandy soil is best for sweet potatoes. Over-rich soil produces luxuriant vines but small tubers. The soil should be moderately fertile, rich in organic matter, and well-worked to ensure looseness. Remove all soil lumps, rocks, or other obstacles that might cause deformity of the tubers, and work in a complete, well-balanced fertilizer at the rate of one pound per 100 square feet or 10 pounds per 1,000 square feet. For good tuber production sweet potatoes must have full sun; in partial shade the vine will be handsome but not very productive. Set the slips on ridges made by mounding up the soil about eight inches high along rows three feet apart. Make the ridges about 12 inches wide, and set the slips at 12-inch intervals. If the soil is too wet, the roots of sweet potatoes may rot; in well-worked, loose soil this should not be a problem. Although sweet potatoes will survive dry seasons, the yield is much higher if they get an inch of water every week until three or four weeks before harvesting. Do not water during the last three or four weeks. Insects and diseases are not much of a problem in the North. In the South, sweet potato weevils and wireworms are common pests. The damage they do appears in the form of stunting or weakening of the plants. Both pests can be controlled by a soil drench of Diazinon. Detailed information on pest control is given in "Keeping Your Garden Healthy" in Parti. Fungus diseases and root rot may attack sweet potatoes. Planting disease-resistant varieties and maintaining the general cleanliness and health of your garden will help cut down the incidence of disease. If a plant does become infected, remove it before it can spread disease to healthy plants. Detailed information on disease prevention is given in "Keeping Your Garden Healthy" in Parti. The tubers are damaged by freezing or cold soils, so dig up sweet potatoes early rather than late, before the first frost. Be careful when you dig — these potatoes are thin-skinned and bruise easily. Cure sweet potatoes in crates in a dark, humid place for 10 days at 80° to 85°F; then store them at 55° to 60°F in a moderately moist place for four to six months. You can also freeze, can, or dry them. Detailed information on storing and preserving is given in Part 3. Sweet potatoes are very versatile; you can boil, steam, fry, or bake them, and they take well to either sweet or savory seasoning. Use pureed sweet potatoes in bread or cookies. Candy them, or stuff them and bake them in their skins, include slices of raw sweet potato with the vegetables for a tempura. Cinnamon, cloves, nutmeg, and allspice all go well with sweet potatoes.